The eyes they say, are the windows to the soul. The eyebrows I say, are the frames! A properly defined brow opens up the face. You can tell the thoughts of a person by watching the eyebrows...most of the time! I'm so glad to be back to my normal healthy self after almost two weeks of being bedridden with malaria...I couldn't even tweet! That's how bad it was! Everything else took the back seat even my hair!! Thank God, I'm back!!!! lalala! Today is the first day I was able to step out of the house for church! Today is also Mothers Day! Many many many ....and did I say many love, hugs and kisses to my wonderful mother God blessed me with! If I ever (and really not ever) forgot what my mum meant to me, I was reminded about it while I was sick!!! I LOVE YOU MUM! MWAH! Okay, as I said, I went to church and to celebrate Mother's Day & my new found health, I decided to do something different with my hair. I'm still protective styling a la #ProtectYaEnds challenge courtesy of care4curls.com . Here's my hair style today! On twitter, my curlista @care4curls was hosting a #ProtectYaEnds challenge throughout Lent. If you recall the post on "Growth and Length Retention", I said that the less manipulation on your tresses, the less the breakage and the better the length retention which equals visible growth. So, this challenge came at a good time! She said she was impressed with her hair as initially, it was hard and "unmanageable" but now was really soft! She said she had been having trouble locating a salon that could cater to her growing natural hair and most salon attendants try to convince her to touch up! She said she was happy with her growth and fullness of her hair and she didn't think she'll go back. One time, she wanted to press her hair and the salon attendant told her she couldn't get straight hair because she was natural. I showed her pictures of naturals with pressed hair and gave her info on how to do it gently with sleek results and of course she wanted a practical on her hair and I obliged! Haha. So here are details on both our hair styles! - The night before, she took down the cornrows she used to wear her wigs. - Very very early (with lots of yawns involved), I sectioned her hair into four (her hair is deliciously thick and full, medium porosity and a type 4c). - Then I shampoo her scalp only with Aussie Moist shampoo (to clarify since she co washed once a week for the past 3 weeks), then I DC 'd with Mayo, ORS Replenishing Condish, Rosemary Essence and Olive oil. Then I double baggied her hair with two shower caps and left on for about 45mins while we got ready for the day. - I detangled gently with my fingers and then with a wide tooth comb from tips to roots, retwisting every detangled section. Then I rinsed her hair under cold running water with her hair still in twists and blotted dry. - After bathing, I applied Organics Rich Olive oil moisturizer since it doubled as a heat protectant. Then I proceeded to stretch her hair with a blow dryer using the "tension" method which involves my fingers...so no high temperatures! - Then I flat ironed using Babyliss Ionic straightner in thin sections applying a pea sized amount of Organics Rich to each section before straightening. I pressed the natural hair only, careful not to press the relaxed ends. I went over the hair not more than twice. Then I applied a dime sized amount of Biosilk serum to the whole hair to preserve the hairstyle. - I proceeded to styling. 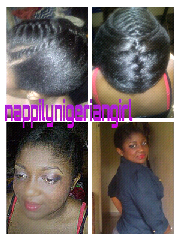 - I sectioned out her hair from front to back into three equal parts. -Then I divided the middle part into two equal parts across from ear to ear. - Then I French braided (it's known as "hannu biyu" or two hands in Northern Nigeria) the front middle section and then made two small flatwists on each side of the braid. - Then I gathered up all her hair (free and braided) into one big French braid down the back. I tucked her ends in and then tied a silk scarf loosely over the whole hairdo to smoothen any frizz. - Then we proceeded to making and dressing up for the day. - I've told y'all my washing routine...so I'll fast forward to styling. - On dry previously stretched hair (from banding), I spritzed a little with water/oil/leave in condish mix for moisture. - Then I gathered my whole hair up on top of my head and tied the topmost tip with a rubber band (make sure not to go more than twice). - Then I tucked that tip in and held it in place with the hair comb. - I smoothened the hairstyle with aloe vera gel (love how it made my hair wave) and sealed in the goodness with my DIY oil spray...#shikena! - Then I loosely tied a silk scarf (my mother's. They enjoyed raw silk scarves back in the day!) to tame flyaways and make the style more polished. -Then proceeded with making and dressing up. Before we both hit the door, we took off the scarves ( and I made a quick turban band with mine). Here are the pictures below. 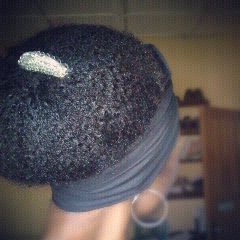 Then smooth on aloe vera and spray my DIY oil and redo my turban. 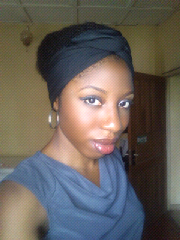 Sometimes, I do those long Zulu type turbans with my hair as reinforcement!